Filipinos are very active when it comes to supporting a good cause and with October fast approaching, everyone is preparing for the Breast Cancer Awareness Month. During October, there are usually fun-runs, concerts, charity auctions, and medical missions to help facilitate check-ups and treatments for women who have breast cancer. Though there are several means for people to help, there is still a lot of work that needs to be done in the Philippines. According to the Philippine Cancer Society, a staggering percentage of Filipinas have a difficult time paying for their treatment, while others are too nervous to continue with theirs. In fact, some Filipinas prefer to ignore the importance of an annual breast check-up and refuse to seek treatment once diagnosed with breast cancer. The Philippine Cancer Society espouses that there is a lack of awareness, access to treatment, but more importantly, the basic knowledge that breast cancer is curable. This is where Marc Coblen, a Dutch brand created by Jordy Cobelens, the same founder of the well-known timepiece TW Steel, comes in to create a change – and a fashionable one at that. Echoing the mantra, “it’s time to change,” Marc Coblen urges women to take a proactive stance against breast cancer and change their mindset about what it is and how to overcome it. In line with the Breast Cancer Awareness program, Marc Coblen has collaborated with the Philippine Cancer Society’s Best Dressed Women of the Philippines and Lucerne, to create a special edition watch called the “Pink Ribbon Watch.” A generous portion of the proceeds of all Pink Ribbon Watch sales will be donated to the efforts and activities of the Philippine Cancer Society in providing consultation and treatment to women with breast cancer all over the country. The Pink Ribbon Watch showcases a 48mm pink Mother of Pearl face with a small Swarovski encrusted pink ribbon. The watch is encased in a Rose Gold finish steel case with pink baguette Swarovski crystals on its interchangeable bezel and uses a pink silicon interchangeable strap with a rose gold clasp. 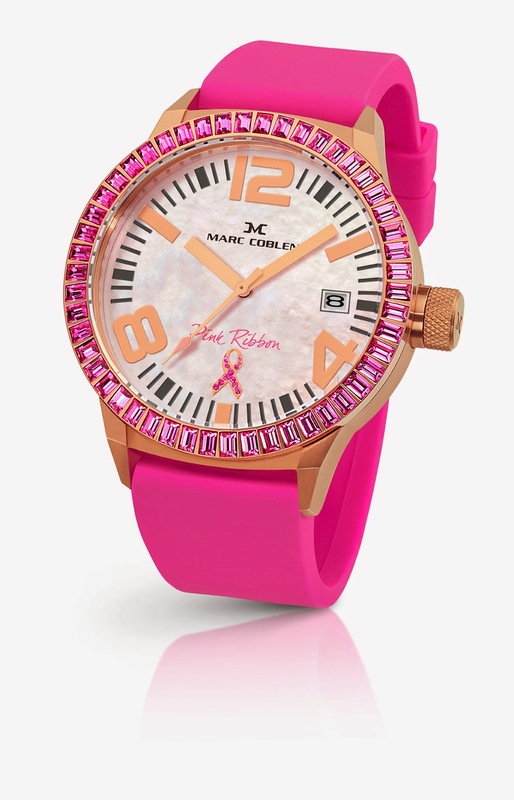 The special edition Marc Coblen Pink Ribbon Watch is exclusive to MASTERCARD and will retail at Php 15,000. In light of the partnership, all purchases will entitle the card holder with a white leather strap and a rose gold finish bezel inside a beautiful white leather watch box. Breast cancer survivors like Patty Betita, Ann Puno, and Liezl Martinez, have stepped up and embraced Marc Coblen’s campaign. They epitomize the several women out there who were diagnosed with breast cancer, but emerged victorious. With all of these strong and beautiful women, they share that the best way to combat cancer is to have the right attitude. Ann Puno shared these sentiments, and also said that more often than not, overcoming cancer is also in the mind. “The most important thing is to be positive,” she said, “Cancer cells feed on negative feelings.” Ann kept herself strong through the power of prayers, and by surrounding herself with the people she loved most. At times, what also kept her going was the knowledge that other people were praying for her to recover, too. Patty, Liezl, and Ann, all emphasize the importance of early detection. They also said that above anything else, women should start effecting changes in their lives. Even if a woman is at the pink of health today, these three women advise that it’s always best to still keep annual check-ups on their list of priorities. “I think that it’s truly time to change,” Ann said, “It’s time to change the way we look at cancer, and we have to stop being fearful in getting check-ups because they mean so much to a cancer patient.” These women have beat down cancer, and urge other women to help each other and build a supportive community. For them, it’s all about recognizing the time to change – and that the best time to do so, is now. Marc Coblen’s local retail partner in the Philippines, Lucerne, will handle the sale of the Pink Ribbon Watch in all Marc Coblen points-of- sales, namely: Marc Coblen Pop-up store at Century City Mall, Lucerne Shangri-La, Swissgear (Greenbelt 1 & SM Cebu) and Wristpod (Megamall, Clark, Rockwell). The design is so feminine and elegant!